It has become a fashion these days, especially among scholars and leaders, to call Vedic scriptures a myth. One of the reasons for this is poor fund of knowledge about how and why the universe is created, maintained and annihilated, and how it is precisely scientific, following certain process at regular intervals. I wouldn’t really blame such people. To cut the long story short, the Pacific ocean is vast enough to remain a myth for a frog in the well. However, that does not make the ocean nor the varieties of inhabitants, including some mind-boggling creatures in it a myth. 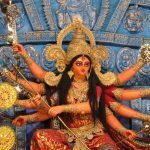 Similarly, an unknown number of authors, who claim to be scholars, have portrayed Mother Durga as a mere symbol of universal energy in other words, an imagination or myth. One must exercise broadmindedness in order to learn more, even if it appears at first to be a myth or a hypotheses. In fact, that is how scientific researches have been carried out and that is how complex mathematical equations are derived and resolved. The word “Durgaa”, pronounced with a long “a” at the end, has its origin in the word “Durga”, pronounced without a long “a” at the end, means a fort, a castle, citadel, or a prison house. 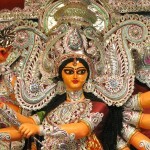 The one in charge of such a Durg or prison house, is known as mother Durga. 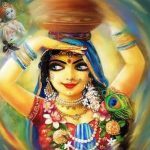 She is the all-powerful supervisor of this material creation, which is actually a prison house created to rectify conditioned souls who rebel against the Supreme Lord, just like a jail is created by the government to rectify those who disobey state laws. All people in this world are prisoners and that is why they are forced to suffer against their will. This suffering has three main divisions: adhi-atmik, adhi-bhautik, and adhi-daivik, which translates into suffering from miseries caused by other living entities, miseries caused by acts of nature, and miseries arising from the body and mind themselves respectively. Ma Durga’s trishul or trident represents these three categories. Let me emphasize that this trishul is not just symbolic, as many so-called scholars quickly conclude; it is a factual weapon that She holds and uses to punish the big time miscreants. As a matter of fact, She does not use it frequently as She can remotely execute Her missions using agents like epidemics, wars, earth quakes, hurricanes, volcanoes, floods and droughts. 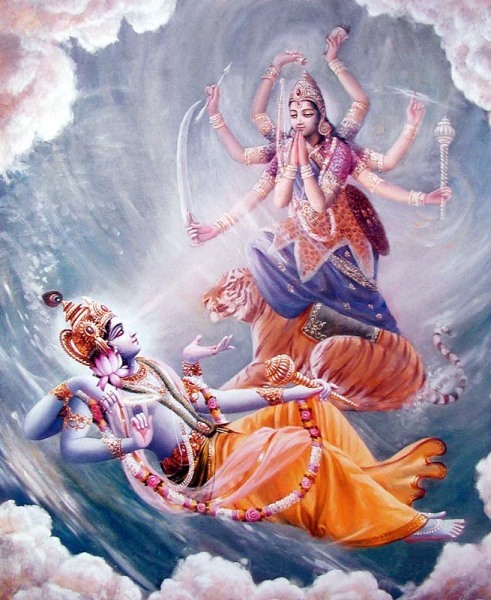 I would not hesitate to state that it is only by the mercy of the Supreme Lord that human beings today are able to invent remote sensors and perform wonderful tasks from great distance; so that one can gradually understand how it is possible to operate natural resources to control this world remotely by various demigods (devatas) from much greater distance- the concept that is generally seen as a myth by less intelligent people. Apart from the many sincere visitors who come to take darshan of Ma Durga, most unfortunately, all that we find nowadays at a Durga puja pandal is wild cinema music blasting over loud speakers, people smoking and dancing like drunks, hawkers selling eggs and other filthy non-veg stuff and drunkards loitering around the pandal. This is specifically true in villages and towns influenced by TV and cinema culture. Some unscrupulous artists have even started depicting Her as per their own perverted imaginations. 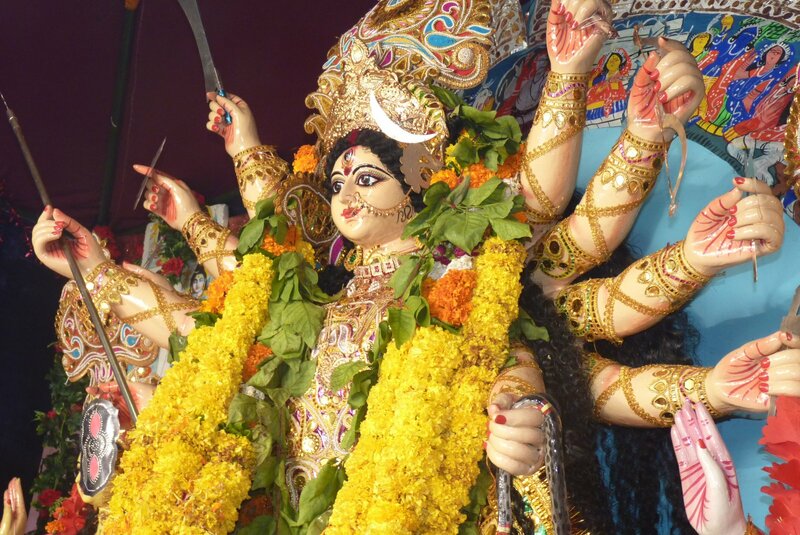 Is this how we worship Ma Durga? Is this how we celebrate Her festival? It is an outright insult to Her most auspicious presence during the Durga Puja festival. The government must curb this fast spreading offense and save people from inviting greater suffering. Shakti or energy always operates under the guidance the shaktiman or the energetic. 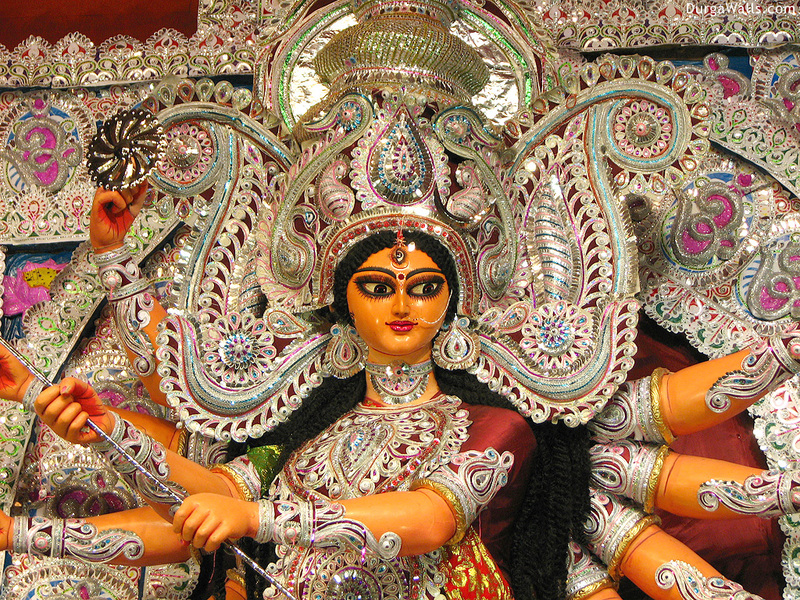 Thus we can understand that Ma Durga and Her multifarious activities are not a myth. She is a person much beyond our mundane intelligence but is approachable by sincere prayers and service. One can understand how prayers work by the example of voice commands on a cell phone. If we can call a friend just by calling his or her name on a cell phone, what is the difficulty in understanding that we can approach supernatural beings by chanting prayers? It is a matter of opening up to the possibilities and realities around us and realizing the truth. 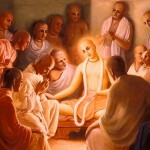 Now when even the western world is moving towards Vedic philosophy, largely due to the preaching carried out by the followers of Srila Prabhupada, at least those who have taken birth in Bharat varsh (India) and have the privilege to practice Vedic life by culture, or by minimum efforts, should take advantage of this timeless knowledge and not get misled by the popular propaganda by western scholars calling it mythology. In fact, calling the Vedic scriptures a mythology is the biggest myth of the world. It is high time we understand and establish the truth for the benefit of all societies, all nations, and all living entities. 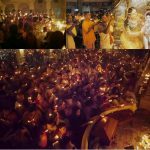 Next articleAre we so far removed from Vedic culture? Struggling to have absolute faith in God? Read this!